Two postcards I came across this week which highlight how ocean travel has changed over 70 years. 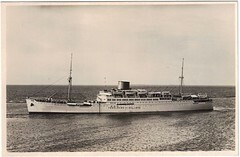 Converted to a Troopship and chartered for the Ministry of War, Liverpool, in 1942, capable of housing 2681 troops. Broken up at Kaohsiung in 1968 after 30 years of service. Built by Fincatieri, in Italy in 1996. 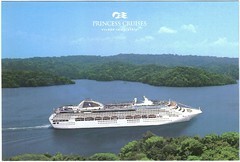 Capacity: 1950 passengers, 900 crew. My father travelled on Tegelberg between India and the UK in 1945. He tells me he remembers being aboard the ship, and how all the children were told to stay below decks at one point during the voyage while they buried a recently deceased Italian prisoner of war at sea. Despite having 1/5 the GRT of a modern day cruise ship like Dawn Princess, Tegelberg was required to carry over 2,000 crew during her war service. One can only imagine how crowded that must have been. I travelled on the Tegelberg from Singapore to Argentina in 1964. With three classes of passengers in a smallish ship it was quite a cosy little community for those of us in first class. Not like the massive floating cities that comprise modern cruise ships. The voyage took six weeks, we had more fun than I recall ever having had since. By way of detail, in 1964 the ship was no longer white, the hull was painted black after the war. The ship was scrapped in China in 1968.